Bake the cake according to the box instructions (duh) and let it cool completely. I was rushed for time, so I stuck it in the fridge for 20 minutes. After the cake is cooled, scoop out the soft, crumbly (and pink) parts of the cake and discard the edges that are slightly tan – it just looks more aesthetically pleasing if the cake ball is all pink instead of pink with burnt brown spots. Pour in 1/2 the container of icing and mix until even. Next, roll the mixture into small balls (about walnut size). Line on wax paper. Rinse your hands every 5-6 balls so that it doesn’t get too sticky. 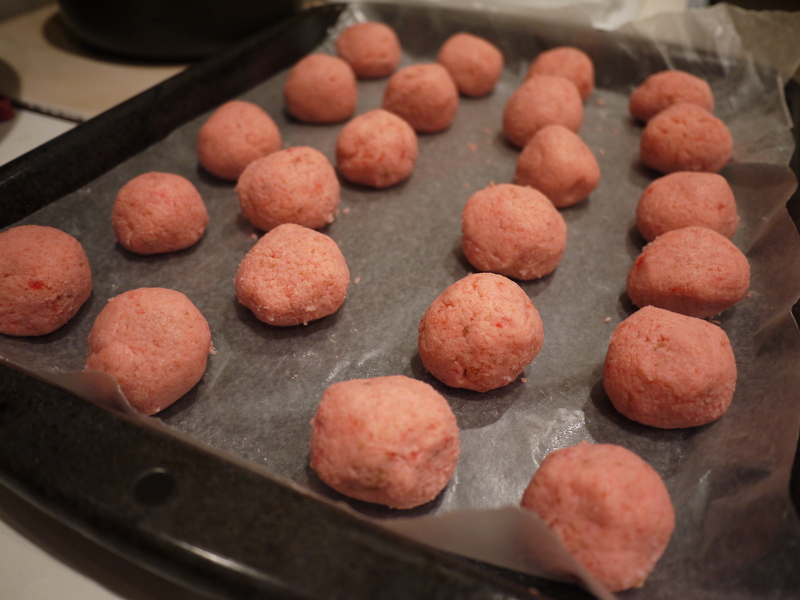 Pop the cake balls into the freezer (uncovered) for at least one hour. 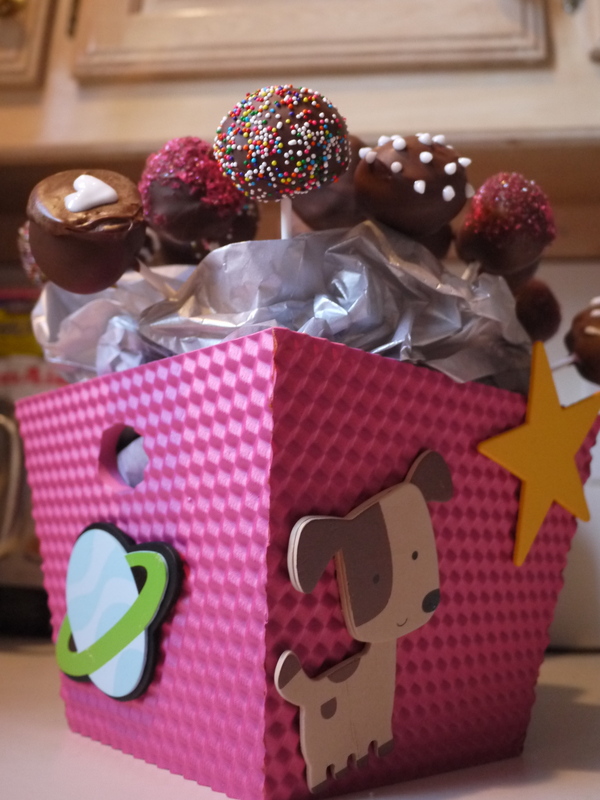 Making them firm will make it easier to put the lollipop stick on and to cover in chocolate. 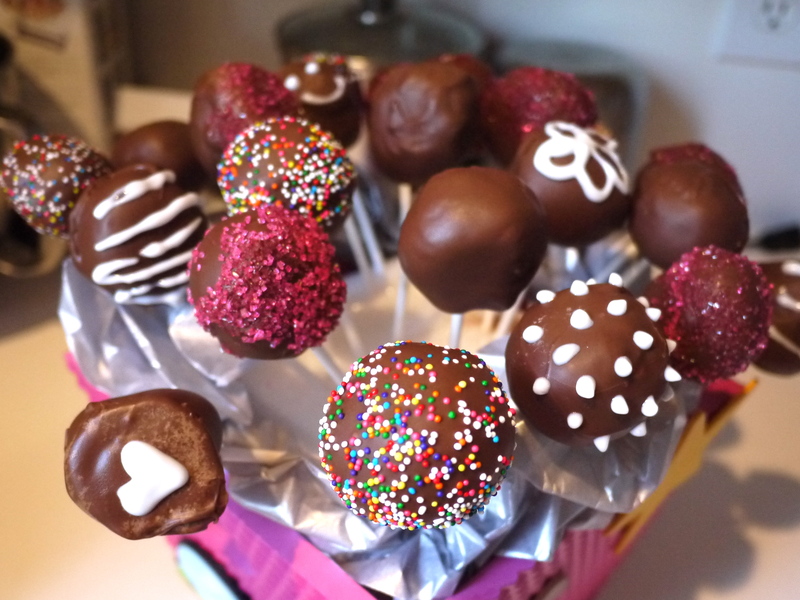 After an hour, push the lollipop sticks into the cake balls. 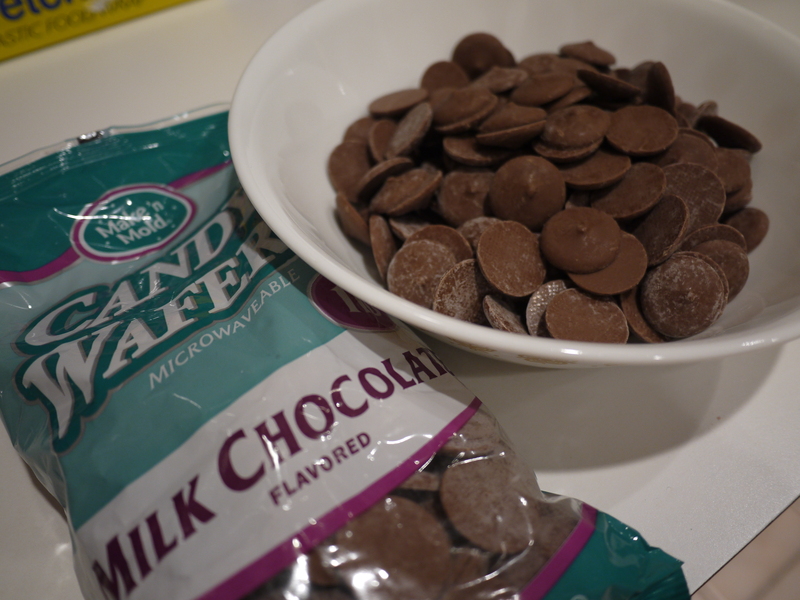 Heat the chocolate chips either in a double boiler, or again, if you’re rushed, put the chips in a microwaveable safe bowl for 30 seconds, stir, another 30 seconds, stir, and then 15 seconds until melted. The next part is the fun part – decorating! Spoon a little bit of chocolate on around the area where the lollipop stick is sticking out of, then holding the stick, roll the ball (in a twisting motion) until completely covered with chocolate. There will be a lot of chocolate, so in the air, keep twisting the stick until the excess chocolate falls off. If you are adding sprinkles, do it now before the chocolate hardens. At this point, some people put the cake ball down on wax paper, but that makes one side of the ball flat. That, by definition, is not a ball. The more tedious – but in the end, more rewarding – way is to keep twisting the stick until the chocolate is dry and your cake ball is round. Rolling it in the freezer helps speed up this process. THEN, you can put the cake ball down on wax paper. If you are decorating with icing gel, wait until the ball is completely hardened. Get creative with your decorating!! For the display, I bought a foam cube, a pink “pot,” and wooden shapes of things maria loves – everything science (she was an astrophysics major! ), the outdoors (especially national parks like me), and dogs (and bruno). you can leave them outside or in the fridge. but given the texas heat, i left them in the fridge until an hour before the party. 🙂 these were a total hit!